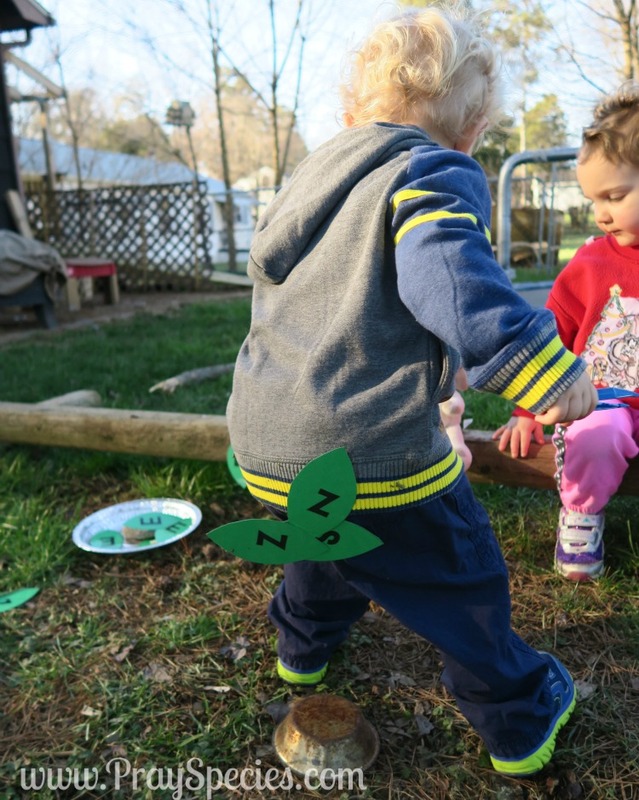 Mother Goose Time supplied our leaves and we strongly recommend their preschool curriculum, especially if you enjoy this activity. 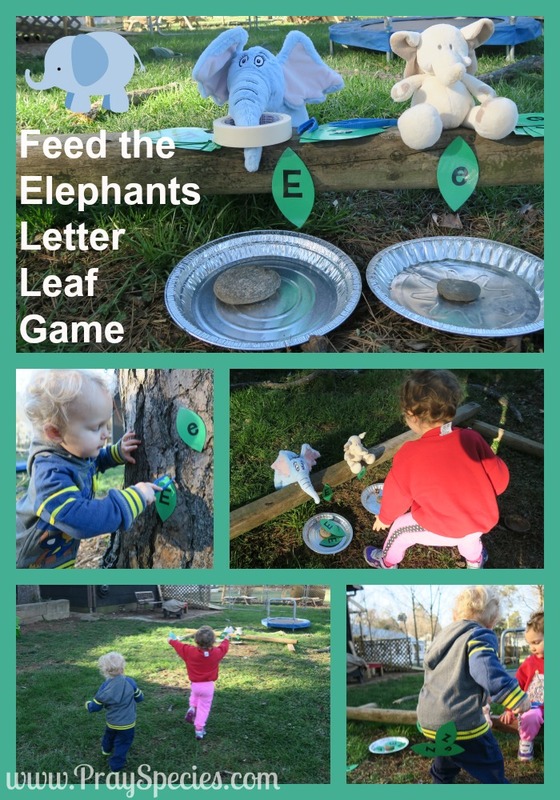 For those of you who wish to give this activity a try, clicking on the link below will take you to a free printable I created for personal use featuring the leaves you’ll need to play this game. I also included a page of blank leaves in case you wanted to write in your own letters. I suggest printing the leaves on card stock and laminating them before you cut them out. Using masking tape, apply the leaves to some trees or a wall, your choice. The children collect the leaves using tweezers or other “trunk” and bring them to the elephants. Leaves with “Z” or “z” should be placed away from the elephants, since they are the wrong kind of food. Leaves picked that have an ant on them must quickly be returned to the tree or wall, since elephants don’t like ants crawling on their trunks. Ladybug and Owl loved this activity. Ladybug was already proficient at recognizing these letters, so she would have flown through the activity if we didn’t prolong it by taking turns and only getting down one letter at a time. She used tweezers for some, but not all of the game. Owl didn’t know these letters before the game, but was doing a great job of recognizing them by the end of the game. He referred to any upper case “E” seen in books as being for “Mommy elephant” for several weeks after playing. 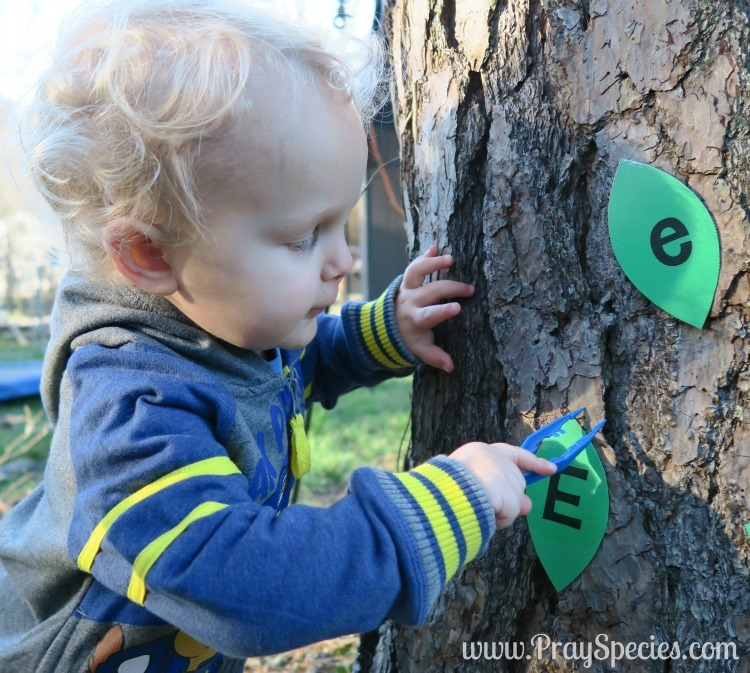 He primarily used the tweezers to knock the leaves off the tree and then picked them up and ran them back. If we were to repeat this game, I would have even more leaves. I might also challenge Ladybug with additional animals that ate more letters, i.e. giraffes eating the letter “G” or rhinoceroses eating the letter “R.” I would also ditch the tweezers and either just let them “pick them” with their hands or try an alternative method for removing the leaves. I would continue having the children grab one leaf at a time and taking turns because it avoided them grabbing the same leaf and prolonged the fun. As an added bonus, placing the leaves on trees a good distance from the stuffed elephants helped them run off some excess energy! This game is a great way to review upper and lower case letters with kids like Ladybug who are already skilled at letter recognition. It’s also a great way to introduce new letters to kids like Owl who are just learning. 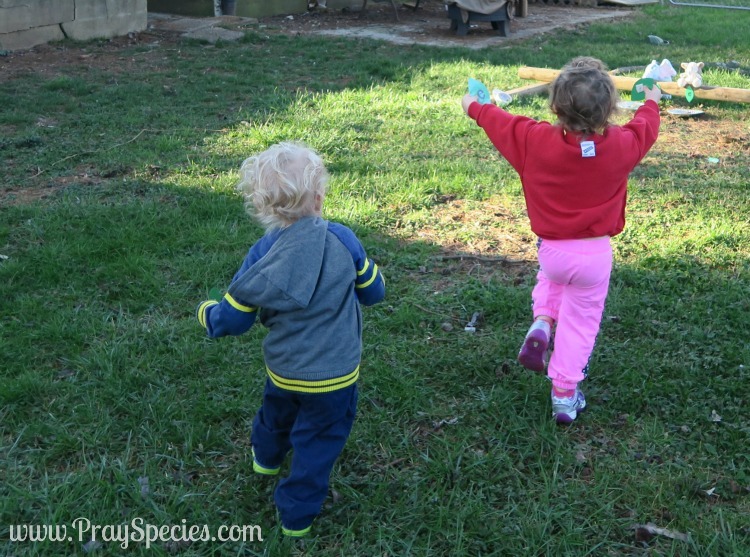 For both kids it was a great exercise in learning to follow directions, practicing fine and gross motor skills, and working together. 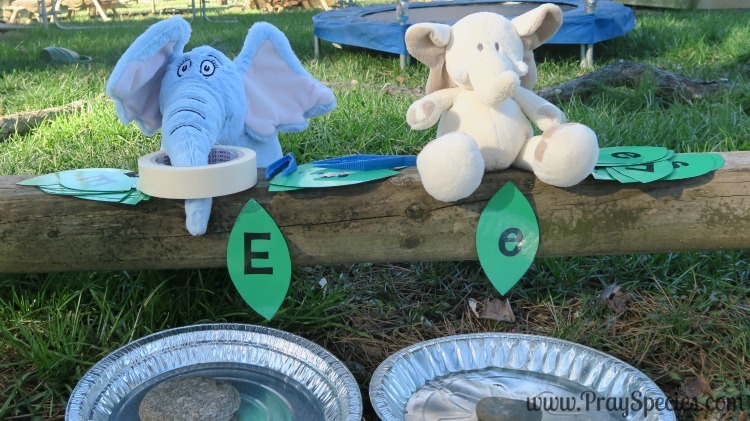 As an added bonus, Owl decided to stick all the letters he couldn’t use to feed the elephants to his little bum, which made for this memorable and laughable picture! The game could easily be modified to help teach other letters. We plan to repeat this exercise with the letter “G” to help learn upper and lower case and to differentiate it from “D.” A “Mommy” giraffe and “baby” giraffe will be used to complete that version of the game. As earlier stated, we also plan to play this game using multiple letters and multiple stuffed animals. G=Giraffe, E=Elephant, R=Rhinoceros, etc. 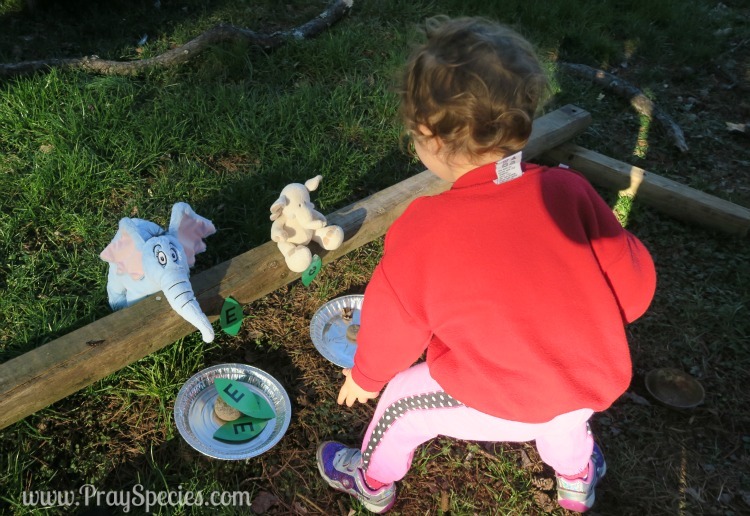 If your kids enjoyed playing this game, you may want to check out the hands-on, play-based preschool curriculum that inspired us; Mother Goose Time.